A picture of Mohamed El-Gendy, posted on the Egyptian Popular Current's official Facebook page. Mohamed El-Gendy, 28, a member of the Popular Current, died in Helal Hospital on Monday after being transferred to the intensive care unit suffering from low blood pressure, a suspected brain haemorrhage and a brain effusion, said health ministry spokesperson Ahmed Omar. 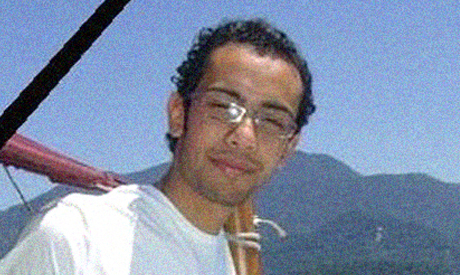 Friends and family said that El-Gendy died after he was tortured in police custody following his arrest at a protest in Tahrir Square on 27 January. The prosecution and forensics department have discussed El-Gendy's case, but nothing official has been released so far, Omar told state news agency MENA. "Many of those arrested at recent protests have suffered torture by the police. The best known case is that of Mohamed El-Gendy," said human rights lawyer Malek Adly on Sunday. "While many are shocked by Mohammed El-Gendy's death, he is not the first to die of torture during Morsi's rule, but you know his name because he is a political activist," human rights activist Hossam Bahgat said via Twitter. Another member of the current, Amr Saad, died on Sunday in Heliopolis Hospital after being injured during Friday's clashes outside the presidential palace in Heliopolis, Cairo. Amr Saad was hit with birdshot pellets during street battles between anti-government protesters and security forces. A statement issued by the current on Monday blamed the president and interior minister for both deaths. In addition, it called on people to gather for the funeral of the two 'martyrs' after noon prayers on Monday at Omar Makram Mosque. Egypt has witnessed intermittent clashes between anti-government protesters and security forces since the second anniversary of the January 25 Revolution. Over fifty deaths have been reported. He died out of hit and run accident. enough rumors. Sincere condolences to his family, friends, and fellow activists. This is very sad news, hoping there will be a full investigation and those responsible held to account.